In The Fall of Language in the Age of English, Minae Mizumura’s refusal to succumb to the dominance of the universal language is both political and aesthetic, as evidenced by the lyricism of her text. To her credit, the author does not employ theoretical jargon, but rather the same lucid prose that characterizes her novels. Luckily for English readers, Juliet Winters Carpenter and Mari Yoshihara’s skillfully crafted translation renders the nuances between katakana and hiragana into English. Indeed, Mizumura’s prose, use of narrative framing, and manipulation of the national language embed the justification for preserving the latter in the text. This volume covers Mizumura’s encounter with the international writing community, the translingual formation of national languages, and a pragmatic assessment of education policy. It is not just Mizumura’s compelling prose, however, but also her use of literary techniques that gives her license to cover such a wide breadth of topics. Her introduction, in the form of a personal essay, conveys the ambiguous identity of a Japanese woman brought up in the U.S. and schooled in French literature. Readers witness how the author’s polyglot upbringing predisposes her to view writing as a medium one must struggle with, rather than one for free self-expression. As such, Mizumura makes a case for writers, not theorists, to ascertain the meaning of world literature. Gradually, the hegemony of English over Japanese shifts from a personal, to a communal, to a national, and, ultimately, to a global concern. Regardless of her upbringing, Mizumura is an author at her core and a Japanese one at that. Her task is the study of world literature: “To be a thorn in the side, a permanent intellectual challenge to national literatures—especially the local literature,” as defined by Franco Moretti. Writing in Japanese adds another layer of meaning to her work, inherent in employing two sets of syllabaries (one implicitly feminine, the other masculine), and reinforces the irreducible difference between the written and oral tradition, as well as the value of linguistic diversity. Ultimately, Mizumura’s comprehensible theories on written language, translation, and national literature are best illustrated in her fiction. A True Novel, her multilayered retelling of Emily Brontë’s Wuthering Heights, alludes to the legitimacy of adaptation as a literary genre. In essence, she advocates for the possibility of enriching world literature by translating into and not only from national languages. Furthermore, her previous An I-Novel from Left to Right tackles asymmetrical relationships between universal and national languages by interspersing sentences in English in a Japanese text. Lastly, she debuted as a novelist by completing Natsume Sōseki’s unfinished novel Light and Dark. In an essay on her prerogative to write the work, she explained, “Sōseki’s sentences, however idiosyncratic, belonged not to Sōseki but to the Japanese language he helped to shape and enrich.” Whereas The Fall of Language analyzes the reasons to salvage the author’s national language, Mizumura’s novels are pragmatic attempts to do so. Minae Mizumura, along with Hideo Levy and Yoko Tawada, represent a generation of authors writing in Japanese with a global consciousness. The latter two are part of the exophonic trend, employing a second language for artistic creation. Neither writes in English: Tawada alternates between her mother tongue and German, while Levy, an American expat, adopted Japanese. Thus, despite Mizumura’s disparaging assessment of contemporary representatives of her national literature, her own fiction and that of these authors proves otherwise to an extent. The fate of national languages lies in the reader’s prerogative to seek knowledge in literature. 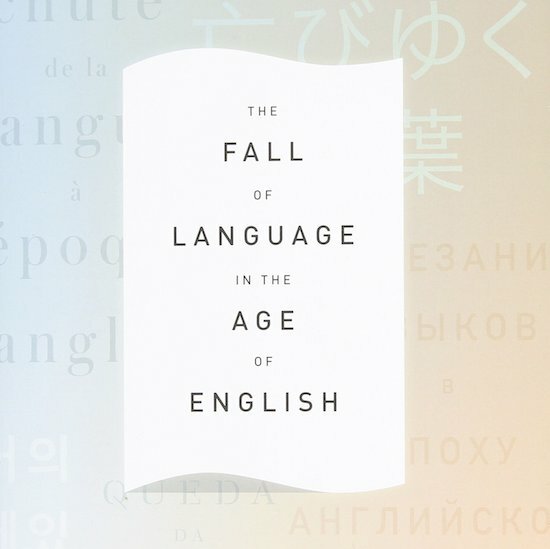 As comparative literature departments grow, world literature anthologies are released, and readers become interested in translation, Mizumura focuses on the fall of national languages. She advocates for English speakers to acknowledge and restrain their privilege, but above all else, she encourages them to read hedonistically. Her argument is clear: the diversity of linguistic and literary traditions indicates the multifaceted nature of truth. Embedded in classic Japanese literature are quiet affirmations of life and the longevity of the national language. Rather than turning to anthologies that reduce foreign literary canons to textbooks, read for pleasure, appreciate the wording the author uses to serve his or her purposes, and ultimately acquire a second—or third! Or fourth!—language. Elisa Taber is a multinational poet, translator, and photographer. Freelancing enables her to shuttle between Argentina and the United States. Currently, she is writing a book of poems titled Mark Making and translating a compilation of Nivaklé myths, an indigenous tribe of the Gran Chaco. Elisa manages Spanish social media for Asymptote. See her website here.